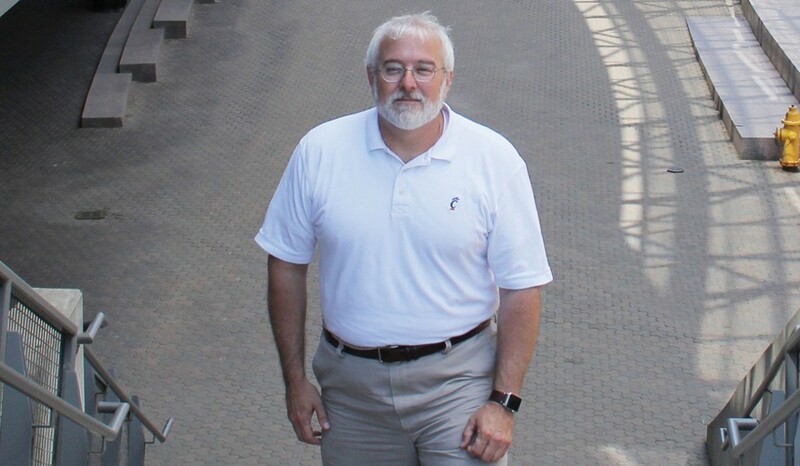 When Rob Rokey started his teaching career at the University of Cincinnati, a physical college of business building did not exist. Classes were scattered around campus. Fast forward 31 years and the UC Carl H. Lindner College of Business is constructing its second building to accommodate rising enrollments, additional programs and faculty hires. Rokey first came to the University of Cincinnati as a student in 1978 and graduated with an accounting degree. After a few years of professional work experience, he fell in love with technology and when he returned to Lindner to earn his MBA, he fell in love with teaching. Since he became director of the Lindner Master of Science in Information Systems (MS-IS) program in 2011, he has been an integral part of its growth and rising reputation. When Rokey first took over as director, the program admitted roughly 40 students. Six years later, between 600 and 900 students apply for 120 spots in the graduate program that proudly boasts a 96% career placement rate with students accepting full-time employment at leading companies such as Google, Deloitte and Goldman Sachs. My greatest satisfaction is to teach students the technology and then have them come back and tell me how they used it to launch a business. To prepare his cohort of students for career success, Rokey requires them to attend a professional seminar and complete an internship. He holds a weekly speaker series each Friday so his students have opportunities to network with high-ranking professionals from top Cincinnati companies such as Sogetti, 84.51°, GE and Cintrifuse. Because "you don't get to make a first impression a second time," he requires students to be professionally dressed. The networking and relationship building with the Greater Cincinnati business community has certainly paid off. Rokey takes pride in placing 100% of his students in internships. Companies know, Rokey says, they can turn to Lindner for top talent. They can now even peruse student profiles online at lindnerprofiles.com, a new initiative he helped launch. Rokey also has a hand in guiding young minds toward careers in information technology. Each summer for the past 11 years, Rokey has directed Lindner's partnership with the INTERalliance of Greater Cincinnati to expose rising high school juniors to technology majors and career paths. As part of the partnership, Lindner hosts 40 students for two weeks. "They get to see what IT is all about," Rokey says. Students visit companies such as Cintas, Luxottica and Great American Insurance Group and compete to create the best business plan using technology. They then spend their nights and weekends living on campus with access to UC's nationally ranked recreation center. Rokey is always amazed at how smart and savvy these young students are and is pleased when they later become students in the MS-IS program. At UC, he's involved in creating a stronger IT environment for the entire UC community. He served on UC's IT Council and is a member of the Faculty Senate IT Committee, having served a term as chair. He's also a steering committee member of UC's Accessibility Network, a group that strives to make the university's online information accessible to people with disabilities. The group's mission hits close to home as his own two children, both UC Bearcats, are legally blind. For his unrelenting effort to help students succeed, Rokey earned the inaugural Dean's Award for Faculty Excellence from the Office of the UC Provost. Rokey is quick to say he doesn't work tirelessly for awards; he works hard because he's passionate about helping students succeed. "If you find something you love to do, you never work a day in your life," he says, repeating a famous mantra. "My greatest satisfaction is to teach students the technology and then have them come back and tell me how they used it to launch a business."